A long-term resident of Moscow said religion is now a key tool for Vladimir Putin to hold on to power. Moscow: The Cathedral of Christ the Saviour stands majestically on the banks of Moskva river near the Kremlin. It has been a major tourist attraction during the World Cup especially for thousands of Catholic fans from the Latin America. The magnificent cathedral is a replica of an even more beautiful church that was demolished during the Soviet communist regime in 1931. The original cathedral, built to commemorate Russia’s win over Napoleon’s army in the Patriotic War in 1812, was to make way for a giant statue of Vladimir Lenin, who spearheaded the Russian Revolution in 1917. It took 44 years for thousands of workers and artists to build the beautiful structure in the 19th Century, but the communist government razed it to the ground in a matter of days. There was no place for god in Russia from 1917 until the fall of communism in 1991. In 1960, a massive swimming pool which could accommodate 2,000 people at a time was built on the place where the cathedral once stood. Passage of time, the demise of communism and Russians’ yearning to revive their religiosity inspired the construction of the Cathedral of Christ the Saviour, which was modelled on its original avatar in all aspects, in the 90s. After five years of workmanship, the white-stone cathedral embellished with marbles and stunning paintings was consecrated on August 19, 2000. 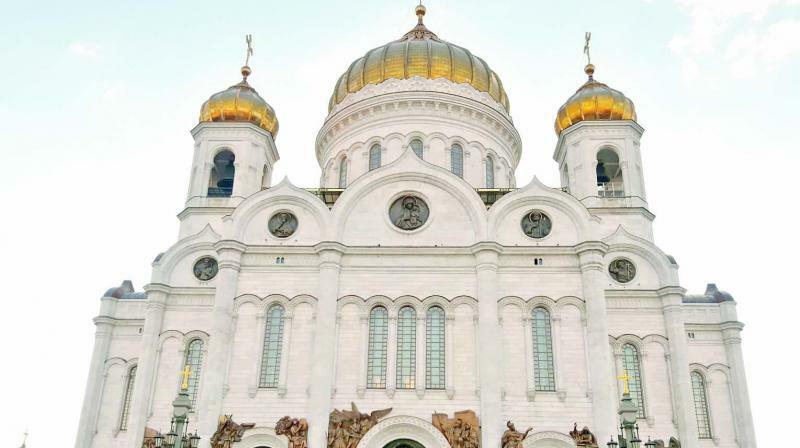 The 100m-tall cathedral with a golden dome and five cupolas for ringing bells is a shining example for Russo-Byzantine architecture. It is an important place of worship for the followers of the Russian Orthodox Church. A long-term resident of Moscow said religion is now a key tool for Vladimir Putin to hold on to power. “Putin knows the power of religion. He likes to be photographed with the head of the Russian Orthodox Church as often as possible,” he added. Religion is no longer the opium of the masses in the former citadel of communism. Putin actively encouraged the construction of one of the biggest places of worship for Muslims in Europe, Moscow Cathedral Mosque, on Olympiysky Avenue here. He also took part in its inauguration in 2015. The mosque with its resplendent minarets is equally marvellous as the Cathedral of Christ the Saviour.